New Gifts for all Occasions! A shipment of goods has arrived from our Hawaiian Supplier, “Island Heritage”, just in time for summer parties, weddings and birthdays! 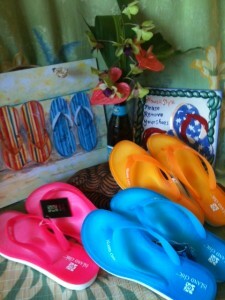 Some of these goods include: gel flip flops in vibrant colors, capiz shell dishes and frames, note cards, carved bone necklaces, glassware etched with hibiscus and plumeria, and ceramic “Welcome” tiles. Come by and see the new displays at Island Home and Garden!